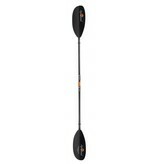 This paddle excels for long distance, mellow water trips. The longer lengths allow you to relax more during long days, and the light swing weight is easy on the shoulders. 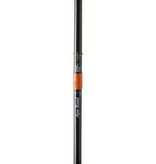 The carbon blade and shaft add stiffness without the weight penalty. 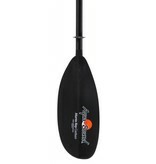 While this paddle is durable, it's not ideal for heavy duty pushing and scooting. The 4-piece break down makes this paddle disappear when the alders show up. If you're looking for a whitewater work horse, check out the Shred model. With its beefy blade, the Manta Ray Carbon is a great choice for high-angle paddlers, those looking for more power, bigger boats, and moving water. The Manta Ray Carbon is the lightest high-angle injection molded paddle available, and its stiff, durable abX blades will help you move some serious water. All this power is balanced out with an ovalized, 100% carbon composite shaft, which means less fatigue and joint strain. The Manta Ray Carbon offers the Posi-Lok¨ ferrule system which clicks into position firmly and securely. The Posi-Lok¨ features strong, corrosion-free composite construction, convenient dual-button release, and infinite feathering angles. Licensed Ferrule US Patent No. 6,881,111.